Telluride is truly a setting to call home. At once a rustic Western town yet neighborly locale, second homeowners and permanent residents alike are surrounded by the breathtaking San Juan Mountains and every outdoor activity therein! Whether looking for the perfect ski condominium or a family retreat in Telluride, the friendliest ski resort in North America, we will be your guide to and help you find the perfect property in the Telluride region. Realtor, Lara Knoerr is a licensed Colorado Real Estate Professional, Member of the National Association of Realtors, Colorado Association of Realtors & the Telluride Association of Realtors. You can utilize her website, ExclusivelyRealEstate.com to quickly find your Telluride or Mountain Village property. Lara works with Sotheby's International Realty in downtown Telluride and is able assist you with all of your Colorado real estate needs. Homes in Telluride and Mountain Village are our specialty. The Telluride real estate market includes properties in Telluride/Mountain Village and surrounding areas. Telluride and Mountain Village offer ski-in/ski-out homes and condominiums, golf and mountain top estates, log cabins, elegant Victorian homes and mountain mesa ranch land. The Telluride regional areas include Telluride Valley, Deep Creek Mesa / Aldasoro, Telluride Ski Ranches, Hastings Mesa, Horsefly / Iron Springs Mesa, Placerville / Sawpit / Down Valley, Specie Mesa, West Meadows / Turkey Creek Mesa, Wilson Mesa, Ophir / Trout Lake, Ridgway - all beautiful mountain towns to call home. Telluride Downtown Condo Sales up 13% for November 2018 Condo sales in Telluride have risen by $1. 4 million in November of this year, a 13% increase compared to November 2017. 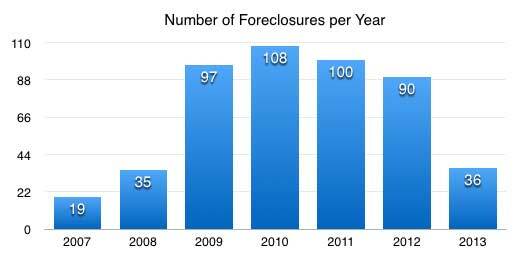 Foreclosures in Telluride Colorado down in 2013! Telluride and Mountain Village resort real estate markets have been on the mend since the lows of 2009 with regard to housing sales.